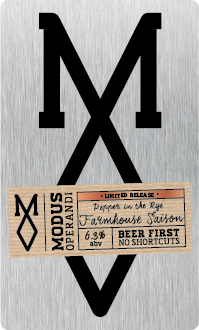 It would hardly be a Modus Operandi beer if it weren’t made in reference to a colourful cultural figure, whether that be Edward Hallstrom of Dee Why, Lola of old Soho or in this case Holden Caulfield, the adolescent protagonist from Catcher in the Rye. It’s supposed to be a fun and unashamedly different beer and it certainly is one that fits comfortably in the style category labelled ‘other’. Working off a Belgian farmhouse base, there are all manner of interesting things going on within; the rye of the malt; clove and pepper spiciness; tangerine and peach sweetness. But despite having a lot of complexity, it all comes together very nicely indeed and drinks easily, like a low alcohol table saison should. However, at 6.2 percent abv you could well end up in a spot of bother if you treat it like it wants you to.